This vegan, Healthy Peanut Butter and Jelly Smoothie tastes so good and is sugar free! 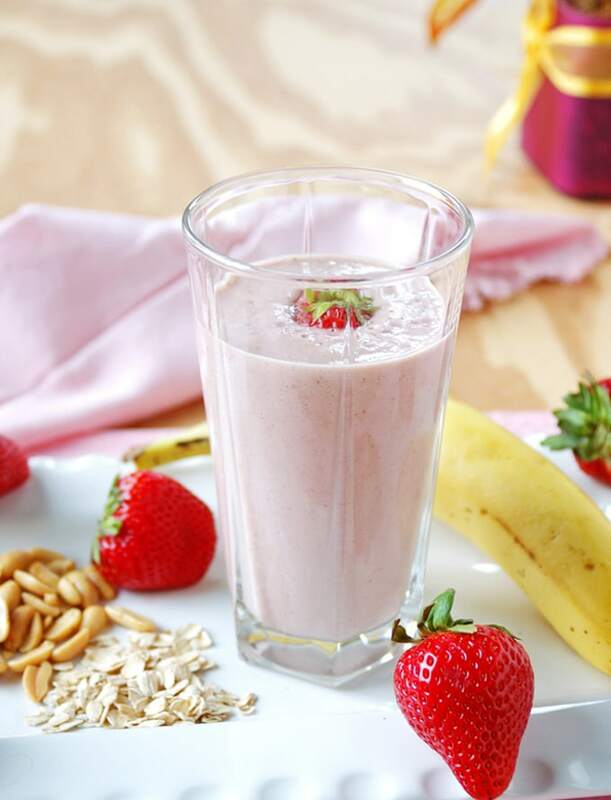 Fresh strawberries, peanuts and oats are the secrets to getting your breakfast smoothie to mimic the flavor of PB&J! This one keeps me full until lunch! I have to admit, I didn’t think I’d enjoy a healthy peanut butter and jelly smoothie. I mean, it sounds weird, right? But one day, I needed to use up my sad-looking strawberries and decided to experiment. I knew from my Strawberry-Grape Breakfast Smoothie that strawberries would provide a nice fruity flavor, so I wouldn’t actually need jelly. And, I knew lightly salted cocktail peanuts work wonderfully in smoothies, producing a fresh, peanut-buttery taste that’s even better than, well, peanut butter. Seriously, if you take away one tip from this lady who makes smoothies six days a week — it’s that peanuts elevate your peanut butter smoothies to a whole new level of deliciousness. And, since I’ve been using unsweetened almond milk for the past year, this is a sugar-free smoothie. I do find it needs a pitted date or a little Stevia, especially if my strawberries aren’t super sweet. But, you may not need any added sweetener if your almond milk contains sugar. With all that said, I’ll tell you there’s a lot of fiber going on here. 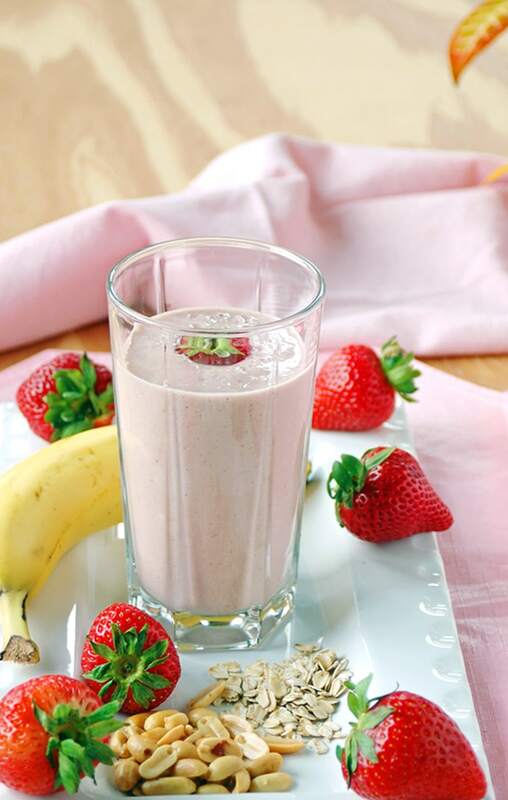 This smoothie certainly gets things moving in the morning, if you know what I mean. (You can use just 1/3 cup of oats if that concerns you.) But I really like that the extra oats help sustain me until lunchtime. And hey, who says eating healthier means being miserable? Not me. 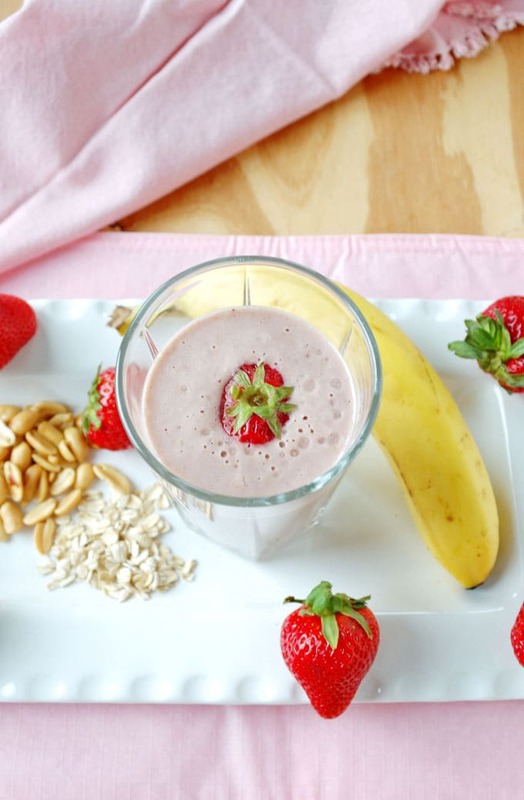 I’ll be indulging in this guilt-free, healthy peanut butter and jelly smoothie for breakfast. Bottom’s up! Vegan, gluten free, sugar free and delicious! If 1/2 cup of oats is too much fiber for you, you can use 1/3 cup. This is such a fun smoothie! I have been drinking so many smoothies lately…I love that you added oats because I bet it gives it a bit more staying power. This is definitely filling, and it makes three cups. I drink it all! Thanks, Jacquee! I also really like sweetening my smoothies with dates, natural and healthy! This smoothie looks amazing! Dates work wonders! Thanks, Diana! 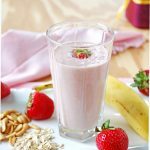 I hadn’t thought of putting oats in my fruit smoothies- what a great idea! I tried adding oats on a whim over a year ago, and it’s worked well for me. This smoothie doesn’t need salt because of the peanuts, but some of my other smoothies need a sprinkle of salt when I add the oats. Holy cow this sounds delicious! I love that it’s vegan too! Thanks, Jenn! I try to eat a vegan breakfast, so all of my smoothie recipes are vegan.